St Georges Park, the FA’s National Football Centre, was recently awarded the Institute of Groundsmanship’s (IOG) Best Maintained Artificial Pitch of the Year. It was a great achievement for head groundsman Alan Ferguson and his team, who have acknowledged the SISIS Osca as being integral to winning the award. Having been nominated the previous year for the same award and narrowly missing out, the grounds team at St Georges Park, this time round, picked up the coveted trophy, and is testament to the great job that Alan and his team are doing on a daily basis. “We were delighted to win the award at the second attempt having been nominated the previous year. It’s the first award for the park so we are especially pleased that the grounds team have won it,” said Alan. “I was particularly pleased for my crew members Andrew Cubbitt, Reece Venning and Luke Bowden who between them have carried out the maintenance. We have also been well backed by Julie Harrington the managing director so it is nice for her to see national recognition for the park,” said Alan. The Desso I-DNA artificial pitches at St Georges Park were installed to the FIFA 2 star standard and Alan uses the SISIS Osca as part of his in-house maintenance programme; which he says is essential after the level of use they receive on a regular basis. 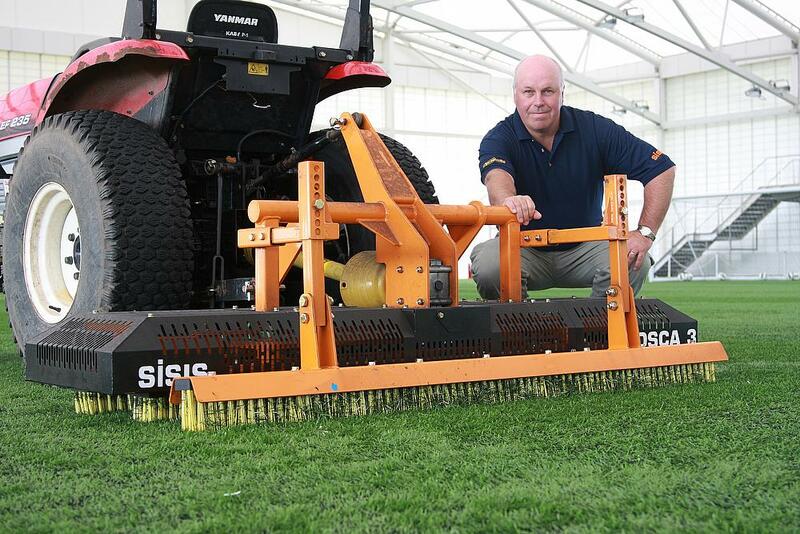 The SISIS Osca is a tractor mounted powered oscillating brush with a 1.9 meter working width and is equally effective when used on artificial turf with sand or rubber infill. The two oscillating brushes stand the carpet fibres up and redistributes the infill evenly, minimising compaction on the surface and improving its performance – giving consistent playing characteristics whilst preventing pile damage caused by reduced infill levels. To complement the final result an additional brush can be fitted to the rear of the unit. Alan, who sees synthetic pitch maintenance as just as important as maintenance on natural turf, believes that there is a place for both surfaces as long as the synthetic pitches are maintained to an excellent standard; something which the FA are committed to implementing. “As a team we have bought into the concept of the 3G turf and see this recognition as reward for the time, money and effort that has gone in to the maintenance programme so far. 3G surfaces are a fairly hot topic at the moment, but I believe they have a place and we as an industry should be working together to find a balance between synthetic, natural and hybrid pitches. The FA are trying to provide more 3G pitches and have them maintained correctly so it’s nice to be seen to do our own well,” said Alan. St Georges Park is an excellent example of exactly how 3G pitches should be maintained. The key to an efficient maintenance programme is quality equipment and Alan is full of praise for the SISIS Osca. “There is no other machine like the SISIS Osca, which sets it apart and makes it that little bit special. It’s allowed us to keep ball roll below ten meters which let me tell you isn’t easy when you consider we have around 40 hours of use on our synthetic pitches each week. “I have always thought its unique oscillating action was beneficial to the synthetic fibre and it has proved to be case. Having used it on two venues now with equal success it is something I would not be without where I have 3G pitches to look after.